Wow! What a crazy start to summer! 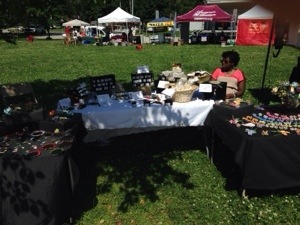 I did two events, a First Fridsy, that went FABULOUS, and another event, the West Park Arts Fest, which did not go particularly well, but was definitely a learning experience. What did I learn, you ask? That event managers and organizers sometimes tell lies to get vendors. 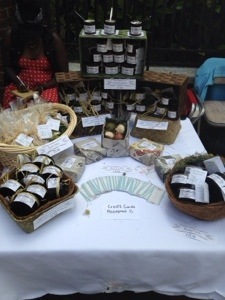 I will be bringing freshly mixed body products from my new Raw Spa, which you can check out at THE RAW SPA . The current line of products is called “Jewel of the Nile”, and was inspired by many sleepless nights researching ancient Egyptian cosmetics and beauty aesthetics. See, I just KNEW I would be able to mix my anthropology major with my work!!! 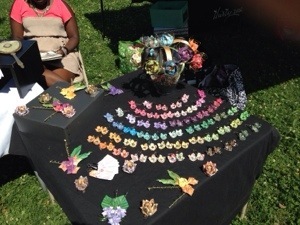 I will also have the butterfly and fish hair pins, the little lotii clips, and a few of the Matahari pieces. Philadelphia First Friday, at 2nd & Church St. This is going to be my first time at the FAPC Market, so I’m excited to see what other vendors will be there! Right now I am planning on mostly having the CREASE origami pieces, so lots of butterflies, fish and flowers! In addition to that, since there is no such thing as TOO BUSY, at least in my overly caffeinated opinion, I’m starting work on the samples for this fall’s Thing That Go BUMP!! collection. Yes, the collection that I promised last year, and then failed to finish. 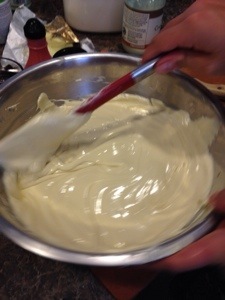 I am even planning to have a line of body products to go with it!!! I’m trying to come up with some fun and funky Halloween products. I feel like all-natural, organic body products are frequently stodgey and boring. What do you guys think? What sorts of things do you think of when you imagine Halloween lotions and such? I’m game for any suggestions you can throw at me! Well, that’s my looooooong over due update. I keep telling myself to keep the blog updated better… I mean, do I really need those four hours of sleep a night, anyway? Or her hats. Damn, did that woman wear hats!!! Or the fact that she was an honest-to-goblins humanitarian. Maybe it’s a combination of all of those. Looks, talent, fashion sense, and a gigantic heart made of pure gold. It’s tempting to completely skip going over my most favorite of her costumes, and just write an essay on her humanitarian work. But I’m going to rein myself in a little. First up on my favorite of her costumes is EVERY SINGLE ONE OF HER COSTUMES FROM “SABRINA”. All of those Givenchy gowns!!! It’s almost like fashion-sensory over load every time I see that movie! I want that wardrobe! 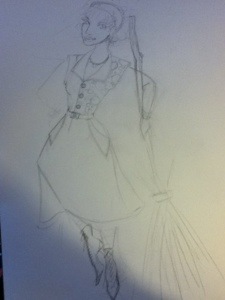 Second are her outrageous period costumes from “My Fair Lady”. I especially love this dress. The simplicity of the lines contrast beautifully with the opulence of the detailing and the jewelry… Okay, maybe that necklace is a little too much. What do you think? 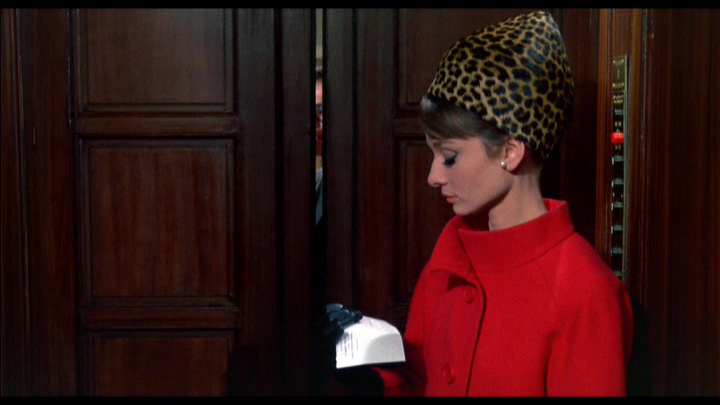 Third, of course, is the black dress from “Breakfast at Tiffany’s”. No, not the long, body hugging black one. This one. The shorter one. With the feathers. 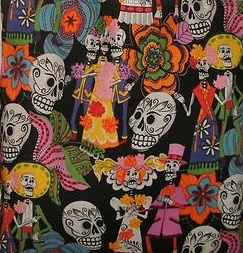 I have a pattern book that has a reproduction pattern for this exact dress. I desperately want to make it, if only to wear it around the house on a rainy day, to play dress ups! That’s in true Holly Golightly style. This concludes my top picks for her costumes. 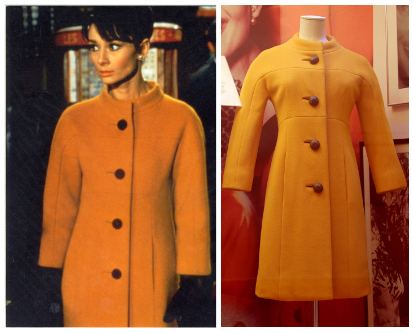 If I had to choose my favorite films of hers, I’d definitely be torn between “Charade” and “Wait Until Dark”. What about you? What costumes of hers do you like? 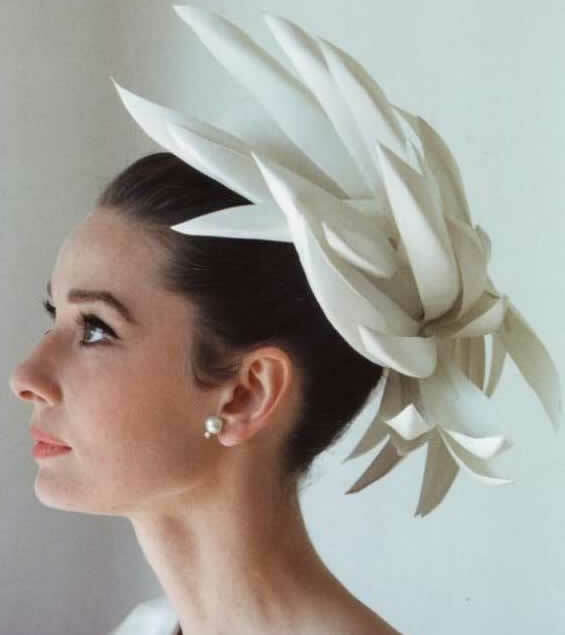 What’s your favorite Audry Hepburn movie? I made a lot of New Years resolutions. Like most people in the world, most of these resolutions fell through the cracks in the first five days. However, one thing that I refuse to let fall apart is my new and improved sewing schedule. I’ve decided to start working with me archives. Between vintage patterns, vintage pattern magazines, and some really stunning (I think) vintage pieces I have salvaged from attics and thrift stores, I have a pretty good base to start from. 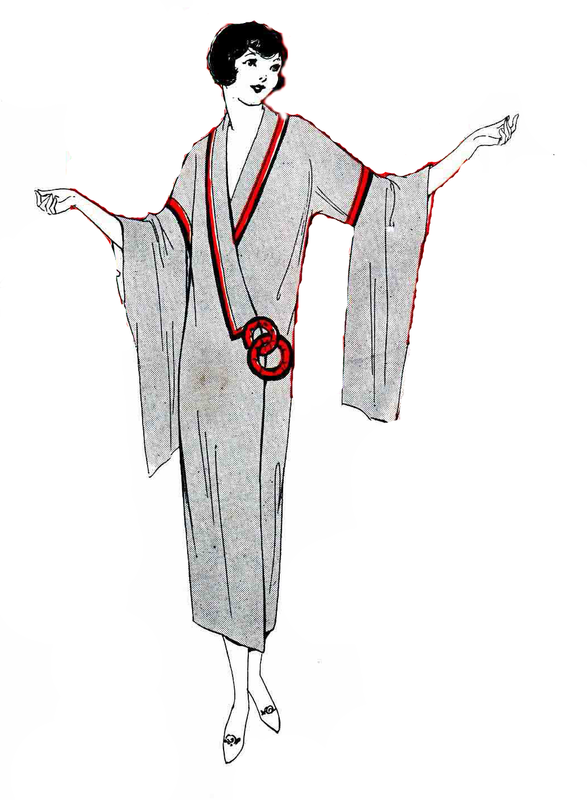 Well, to refresh my memory, it’s this little number, from the 1925 Spring Fashion Services Magazine. Kimonos are fairly straight forward in their construction; they are just rectangles of fabric sewn together in a specific way. The instructions for this one say to use McCall pattern #3825. 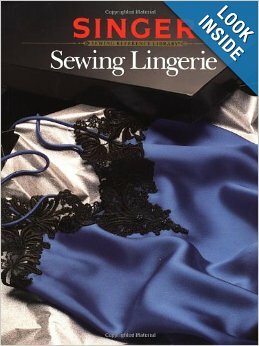 Given that this would have been in the 1920’s, and that it has long since been out of print, I have instead decided to use the kimono pattern in my go-to lingerie sewing seer: Sewing Lingerie, from the Singer Reference Library. It’s should go together pretty quickly. 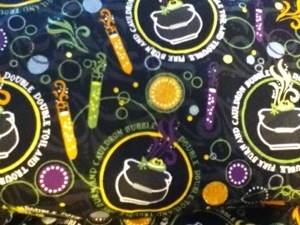 And I even have the fabric for it! It’s just a polyester crepe that I picked up at Ye Olde Jo-Ann Fabrics, but I think it will work just fine. For the closures, I think I’ll see if I can pick up dome wooden or metal hoops at the craft store, and wrap them with ribbon. But we will see. I’m also finally going to be trying my hand at embroidery. This pattern is from “Pretty Pretties”, a wonderful little e-book available on Etsy, from MrsDepew. If you haven’t checked out her store, you should! 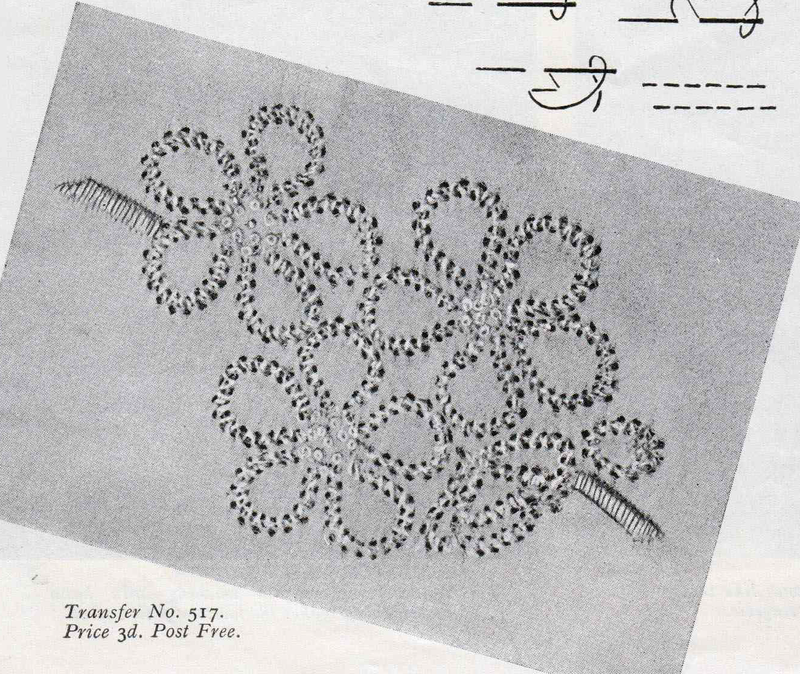 She has an absolute treasure trove of vintage patterns, magazines and digital reproductions! Anyway, it needs a special needle, which I have, and I even picked up two different shades of blue that will look lovely with the fabric. I think I might put it on the tails of the sleeves. To save all of us from a heavy dose of depression by telling her bio (which you can read here, but, WOW, have some Prozac on hand!) I’m just going to show you what I think are her absolute BEST costumes and looks! Second on my list is the white foofy dress from “The Seven Year Itch” (1955), for no other reason than that it’s become such an iconic image. On a quick side note, I had a dress like that once. 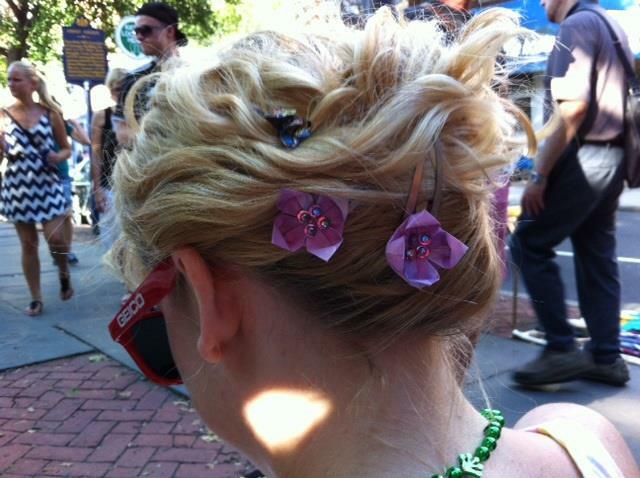 When I moved to Philadelphia, I stopped wearing it, because every time I walked up the steps from the subway station, my skirt blew up over my head. It looks super hot in the movie… but when you’re juggling a book bag, a purse and a mug of coffee, it’s down right humiliating. 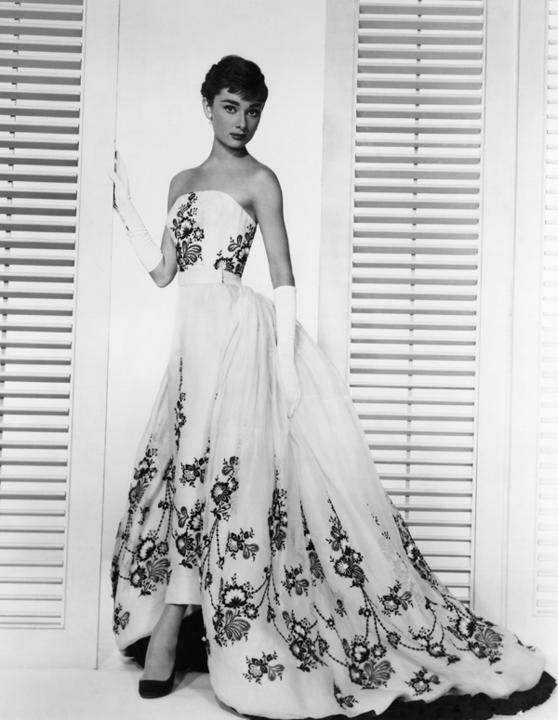 Third is her entire wardrobe from “How to Marry a Millionaire” (1953), but most especially this stunning evening dress. WOW! This film holds a particular place in my heart. 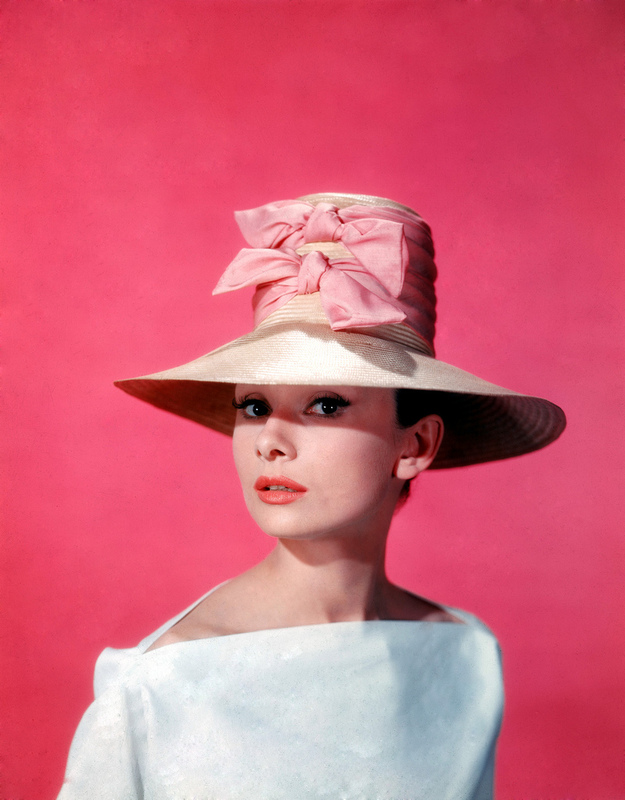 It was the first time I ever saw an actress who was portrayed as glamorous, even though she wore glasses. Having had a bespectacled childhood myself, I always knew exactly what drove the character to take off her glasses in an attempt to look beautiful, despite the fact that she would walk into things. And finally, the costumes from “Some Like it Hot” (1959). Let us pause to take a moment here to recount some of the fashion atrocities committed on the red carpet in the past ten years. Like the scrap of fabric Jennifer Lopez wore, back in the day. Or, more recently, some of the stripper-ific get ups Katy Perry has been seen in. Some times these ladies have no shame, right? 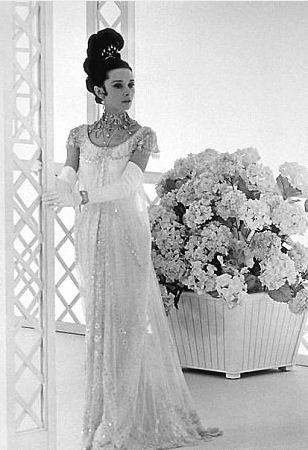 If only they could take inspiration from the more tasteful and glamorous times gone by! 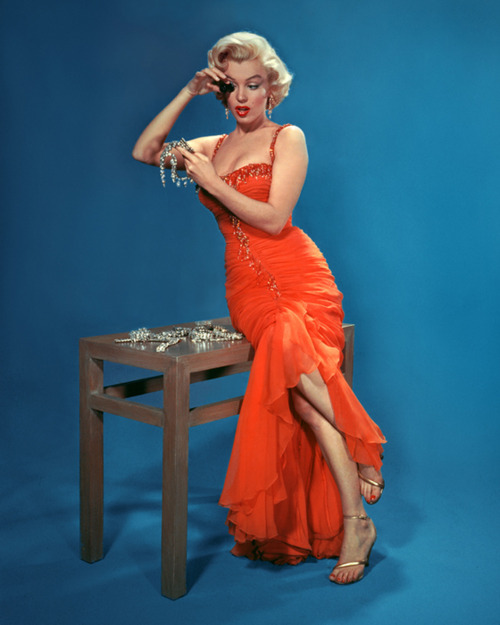 Well, considering that some of the costumes Marilyn wore in this movie really WERE just scraps of fabric, with some strategic sequin placement, I’m suddenly seeing the fashion faux pas of my generation in a whole new light. Although, I can not lie. I have a pretty good approximation of this dress. 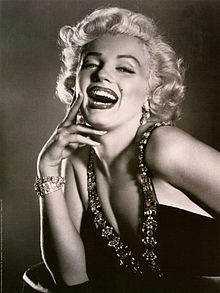 I hope you have enjoyed my top favorite Marilyn looks. What about you? What do you think were her top looks? It’s been a while since I’ve written. 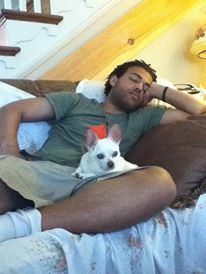 The good news is that my puppy, Beasley, despite Murphy’s Law, survived his ordeal and is doing wonderfully. Thank the goblins for small favors, because if I lost him or Jack the Parrot, I think I would be utterly lost. I have recently been working on a series of sample bras. They are very pretty vintage designs, and I bought beautiful, slinky, silky satins, and stunning kimono fabrics to make them. 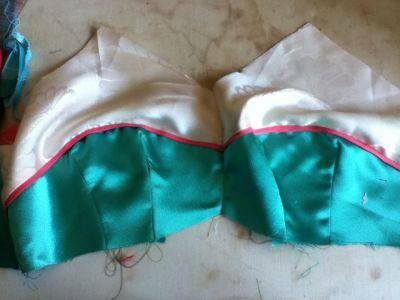 Being the genius that I am, I took my pattern, and cut out all the pieces in all of the fabrics I had, all in a 36B. Right there was the first series of mistakes. I should have cut the damn thing out in muslin and sewn it up to make sure the pattern was okay. But I didn’t. My new fabrics filled me with excitement and perhaps more optimism than I should have had for such a daunting challenge. And then I sat down to sewing… having NOT made a test muslin first, to make sure I knew exactly how to assemble these beautiful bras. And having not put a SINGLE MARK on the pieces to help me in the assembly. At first I thought I was on a roll. I had a bit of trouble with my darts, but I forged ahead at reckless speed. Once the first one was done, and only needed to have some hand stitching down, I noticed that it just looked… well… it looked WRONG. Because I had sewn two pieces BACKWARDS, and had done the most beautiful, miniscule French seams the world had ever seen. There was no salvaging or fixing my mistake. So I surrendered that bra, and continued on like a run away train. I put together two new bras, still in the glorious (expensive) silks and satins. Another one suffered the upside down fiasco, but I was determined to fix that with the cunning use of lingerie elastic (on non-existant seam allowances, because I trimmed those off…). There were nightmares with trying to encase elastic with bias tape, which created horrendously bulky underarm seams (because both the bias tape AND the elastic were all wrong). There was my failed attempt a what could have been beautiful piping detail, because I had no idea what I was doing. There were seams and stitches that were picked out so many times that the fabric disintegrated, and then there with the horrible, ugly , visible seams that you could SEE, because I ran out of the appropriate colored thread. I was like a zombie mindlessly hell bend on finishing. Or a lemming, DETERMINED to charge off that cliff if it was the last thing I did. The first sensible thing I did, was take an enforced two week break from the projects, to get ready for two back to back events I was privileged enough to be a vendor at. 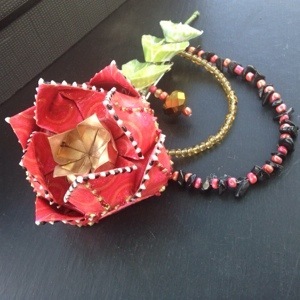 For two weeks, my sewing area sat fallow, and dust covered, while I barreled through 200 lb.s of origami paper to make these stunning hair creations and more (not that I’m tooting my own horn, or anything…). And I was equally as maniacal about these pieces as I had been with the bras… the results were just better. After two weeks, I returned to my derelict sewing area, and picked up the bras. They looked wretched. So I did the second most sensible thing I could think of. I went online, to the wonderful vendor of vintage patterns, and found a tutorial for sewing a vintage bullet bra. And there, before my eyes, in black and white print, and colored photographs, I saw EVERY SINGLE ONE of my mistakes spread out before me. Such as including seam allowances in my pattern pieces. Such as using an iron to press seams before barreling ahead. Such as matching seams before you sew them. It was embarrassing. I know better. I’ve known better for years. But I was so excited with the gorgeous, dazzling fabrics I chose, that I was determined to skip all the appropriate steps, and convinced that the end result would be just as good. The sewers, seamstresses, and designers out there will not be surprised to learn that I was disappointed. Over 100$ of supplies were chucked into the garbage, the fabrics now too degraded from abuse to be salvaged for anything more than cleaning rags. This week I sat down, resigned to the fact that I have not yet achieved Alexander McQueen perfection with my “sewing-by -eye”, and cut out a muslin that fit my fairly hefty 38DD torso. I figured that if I was going to drag myself through hell again, I was going to make something I could wear. The muslin, including all of the tweaking and pattern redrafting, took me thirty minutes. Just thirty minutes. Then I cut into my beautiful fabrics again, and spent an extra two minutes marking all of the pieces. Just two minutes. And then, before I could do any damage, I called it a day, and spent the rest of my time drawing up an sewing order, so that the bra would go together nicely. Had I bothered to take 32 minutes out, before I let myself loose on the project, I could have saved myself an ENTIRE MONTH of needless cursing, tantrums, and tears. The moral of this story is that, yes, “Time is money”. By which I mean that you will WASTE money if you do not take the time to go about things the proper way. Sometimes, I just can’t help myself. I’m sure a lot of people have this problem. Maybe you see the perfect pair of jeans in a store and you buy them for 110$, ignoring the fact that they look EXACTLY like EVERY, SINGLE, OTHER pair of jeans in the WORLD. Or maybe every time cellphones go on sale, you buy five of them. Not because you need them, but, because, c’mon, they were on SALE! Actually, maybe most of our problems with over buying would be solved if stores stopped offering “buy one, get X” sales… You can ponder this for today and get back to me! As I was saying, this impulse control issue with spending is perfectly normal. I myself am known to spend almost beyond my means. And it always comes back to bite me in the tush. My most recent splurge was the result of my throwing a tantrum at the fabric store over the cutting counter gremlin. 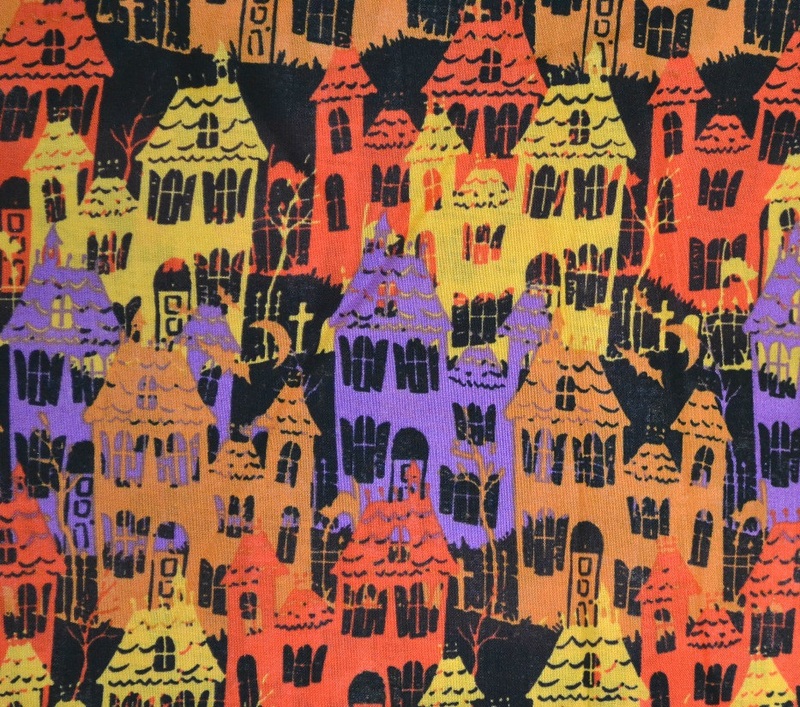 I happen to love Halloween, and this fabric is just so PERFECT. SO I bought ten yards of it, with absolutely no idea what I was going to do with it. Always with no idea what I was going to do with it. I just knew that I wanted it. And that was when it hit me. I don’t really have the time to do a full scale, 500000000000 piece collection… but why not a Limited Edition Halloween collection? I ran this idea by my Friend-Who-Remains-Anonymous. And, yet again, I was stumped. How does one “create a buzz”, I wondered. Ha! that’s where he was wrong! I showed him my posts. I think he was expecting a little too much from me. I think he was probably over estimating my abilities, too. And that, ladies and gentlemen, sealed the deal. This officially goes to my first cup of free coffee!! I win!!!! !